Growing up as a Christian, I was taught about the whole "love thy neighbor" thing. I was also taught that "neighbor" was not to be taken literally. The Jesus character was not saying that I should be nice to people who lived near me and treat those who lived a greater distance away poorly. He was not saying that I should be kinder to people who looked like me or spoke the same language than I was to others. I was told that "neighbor" should be interpreted in the broadest possible sense as referring to one's fellow humans. What Jesus was really saying was to love other people. Personally, I've always preferred an alternative phrasing: "Be excellent to each other" (from Bill & Ted's Excellent Adventure), but the basic idea is good either way. I always thought this was one of the more admirable things the Jesus character was depicted as saying. As a Christian, this was one of the aspects of Christian dogma with which I was happy to associate myself. You can imagine my surprise, then, when I discovered years later that many Christians adamantly reject how I was taught to interpret this statement. For many evangelical fundamentalist Christians, "neighbor" had a much narrower meaning. For some, it referred only to American citizens. For others, it referred only to White American citizens. And for most, it referred only to Christians. From this point of view, Jesus wanted us to love people like us and did not particularly care about anyone else. I have heard this sentiment expressed countless times over the course of my adult life. "Jesus wants us to love other Christians; he doesn't give a damn about the rest of them." For these Christians, it is all about us (i.e., Christians) and them (i.e., everyone else). As an atheist who is skeptical about the existence of a historical Jesus, I still prefer to think of the broad meaning of these words as applying to everyone. I don't believe that the character of Jesus described in the various versions of the bible bore much resemblance to the real person, if such a real person even existed. And yet, I still consider the sentiment expressed in those words to be a positive one. If I had to put my finger on something good about the Jesus character of the bible, this one would be an easy choice. I wish more Christians interpreted it broadly and tried to do as they were instructed. If I had to identify an example of how the bible (and every other "holy" scripture) is interpreted to suit the whims of those doing the interpreting, this would be an example that would come to mind quickly. If you are a decent person with compassion for others merely because they are your fellow humans and you happen to be a Christian, you'll probably interpret "neighbor" quite broadly. If you are a selfish and mean-spirited person who views empathy and compassion as evidence of weakness, you'll probably interpret "neighbor" in a rather narrow way. The meaning one makes of this statement says far more about the individual believer than it does the "holiness" of the text involved. And that two people could read the same words and reach such different conclusions tells us much of what we need to know about "holy" scriptures. For the Christians who interpret "neighbor" broadly, those who do not are not "real Christians." For the Christians who interpret "neighbor" narrowly, those who do not are not "real Christians." As far as I'm concerned, they are all real Christians. Their interpretation of these words tells us something informative about the sort of people they are; it does not tell us much about Christianity itself. 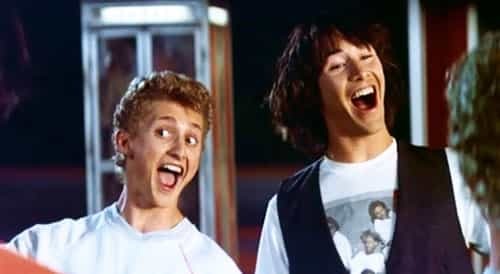 As Abraham Lincoln once said (in the Bill & Ted movie), "Be excellent to each other. And... PARTY ON, DUDES!"